Since Halloween is right around the corner, and today marks our final Halloween Weekend (sniffle), I thought we’d share a pumpkin camping recipe. Mix all ingredients ‘cept for cake mix and butter in large bowl with whisk. Line inside of dutch oven with foil. Pour liquid into dutch oven. Carefully sprinkle dry cake mix on top of pie filling. Slice the stick of butter and spread slices onto top of cake mix. Cover Dutch oven and begin the heating process. Cooking will depend on the amount of coals you have and your Dutch oven. Cook until cake mix turns golden brown. – Recipe courtesy of Scoutorama.com. Now that the weather has gotten bit cooler and Fall is in the air, chili is always a fan favoritei. I know several of our campers have been making chili during our Halloween Weekends, because I can smell it cooking! 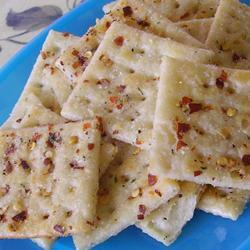 Next time you make a batch of chili, try these spicy crackers along with it. I bet you’ll love ’em. Place vegetable oil, garlic powder, onion powder, black pepper, ranch dressing mix, and crushed red pepper flakes in a 2-gallon plastic zipper bag. Seal the bag and squish it with your hands to really combine the oil and spices. Mix well. Place the crackers into the bag, seal, and turn the bag over and over to cover crackers with the spice mix. Let the bag sit for about 1 hour, then turn again. Repeat several more times until the crackers are well coated with spice mix, and allow the bag to sit overnight. Remove crackers and serve. – Recipe courtesy of AllRecipes.com.